Toothache pain ranges from throbbing to excruciating, but a good dentist can alleviate the pain quickly. If you can't get to a dentist right away, the wait can prove agonizing. That painful wait may be one reason why so many over-the-counter products and home remedies exist for treating painful teeth. And those including cloves may actually work. Cloves contain eugenol, a chemical compound widely used as an analgesic and local anesthetic, particularly in dentistry. Clove oil provides the greatest benefit for toothaches, but you can get the same numbing effect from whole cloves. A simple remedy for a toothache consists of placing a few whole cloves in your mouth, moistening them with saliva until they soften, then bruising them between your non-painful molars to release their pain-relieving oil. Hold the softened cloves against your painful tooth for up to 30 minutes before discarding them and beginning the process again. Repeat several times per day as needed to relieve pain until you can get to a dentist. 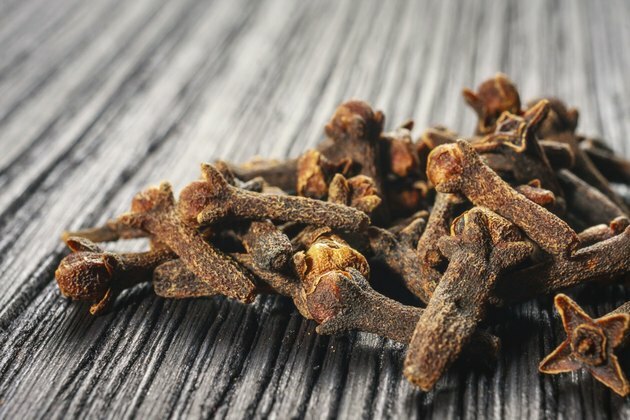 Crushing whole cloves before placing them against your tooth also relieves a toothache. This remedy works best for a toothache so painful that crushing the cloves inside your mouth is impossible. Take a piece of cheesecloth or other thin, natural fabric and place 3 or 4 whole cloves inside. Tie the cloth around the cloves to make a small bag, then place the bag on a table and crush the cloves with a hammer or heavy book. You can place the entire bag in your mouth against the tooth and moisten with saliva to release the oils, or sprinkle some of the resulting clove powder over the tooth. Whole cloves combined with cayenne pepper create an effective toothache remedy, though when applied, the mixture may cause a burning sensation for the first few minutes. Crush a few whole cloves and mix with equal parts cayenne pepper powder in a small mixing bowl. Add a few drops of water to make a thick paste, then roll a small cotton ball into the mixture to thoroughly coat the surface. Place the cotton ball directly onto the affected tooth as needed to relieve toothache pain. This treatment may irritate the gums, so try to keep the cotton off your gums and on the tooth. Eugenol can be toxic if ingested. This treatment should be avoided in children who are likely to ingest the oil. See your dentist for an accurate diagnosis of the cause of your toothache. Seek immediate attention if you have swelling or drainage with your tooth pain -- you could have an infection.